One of the players hoping to make it to the World Cup with Nigeria has dropped out of the race to Russia. The 'unfortunate' player is Simon Moses who plays his club football in Belgium with Gent and was on the 30-man provisional World Cup list released before now. “Moses Simon will not be traveling with the team on Tuesday because he’s injured,” Nigeria coach Gernot Rohr told reporters in Port Harcourt after the team’s training session. “The nature of his injury is such that he won’t be recovering quickly enough to make the World Cup. The Super Eagles will jet out to London on Tuesday where they will face England on 2 June in another warm-up match. 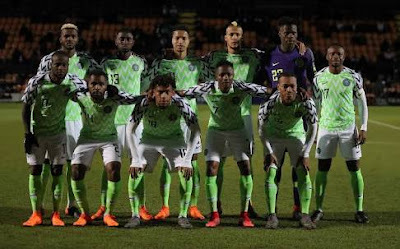 Four more players aside Moses Simon will not be making the London trip with the Eagles who after playing in Wembley will head off to Austria where they have a training camp and play a friendly with the Czech Republic, before going to Russia for the World Cup.